Do you want a quick, easy and inexpensive way to brighten up your kitchen? Get new towels!! Our colorful towels, featuring vintage fruit crate label art, are the perfect choice. 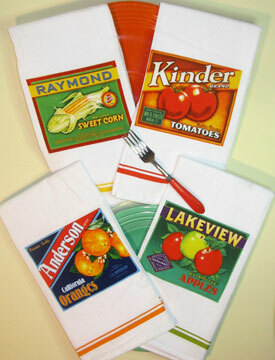 Made of 100% flour sack cotton, they’re lint-free and perfect for drying glassware and anything else in your kitchen. Each measures a generous 27” X 27.” Choose from the Fruit Set (apple and orange) or the Vegetable Set (tomatoes and corn). Better yet, why not get both.